A photo from the Florida Fish and Wildlife Conservation Commission shows a giant eyeball from a mysterious sea creature that washed ashore and was found by a man walking the beach in Pompano Beach, Fla., on Wednesday. 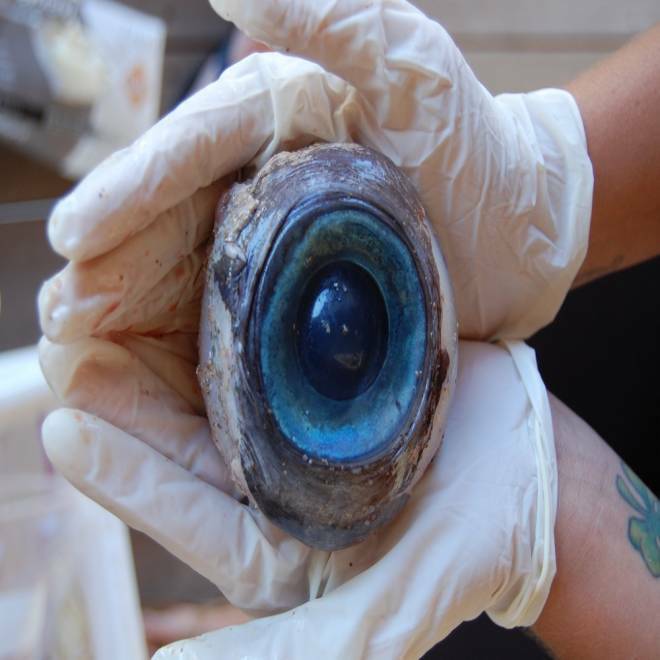 The eyeball will be sent to the Florida Fish and Wildlife Research Institute in St. Petersburg, Fla.
A giant eyeball that washed ashore and was found by a beachcomber in Pompano Beach, Fla., is mystifying wildlife officials — but probably not for long. The softball-sized eyeball was reported to the Florida Fish and Wildlife Conservation Commission on Wednesday, and wildlife officers put the specimen on ice. It will be preserved and sent to the Fish and Wildlife Research Institute in St. Petersburg, Fla., for analysis. Marine biologists couldn't immediately identify which species of sea creature would be associated with the eye, but researchers will use genetic testing if necessary to solve the mystery, said Carli Segelson, a spokeswoman for the commission. "I shouldn't say this, but they may be able to eyeball it," she told me today. Segelson said she's been fielding tons of inquiries about the case, especially since a picture of "THE MYSTERY EYEBALL" was posted to the commission's Facebook page. "It's just gone viral," she said. There are more pictures in the commission's Flickr photo gallery. Some have suggested that the eye came from a monster fish, a giant squid or even a whale. It does look a bit like this picture of an eye from a giant squid, but Segelson said wildlife officers are leaning toward a different scenario. "The primary suspect right now is that it would be a large fish," she said. Among the possibilities are a swordfish, or a tuna, or some sort of deep-water fish species. What do you think it is? Feel free to give it your best shot a comment below, and keep your eyes peeled for the answer.